Compare how fast objects move down ramps when ice and rolling balls are used, and learn about friction and how it can be reduced. 1. the ramp is constant, and different materials are slid down it, including rolling balls and ice cubes. 2. ramps are made of ice and other materials, and the same heavy object slid down each of them. Test this activity before running with your materials - friction is a complex set of forces and can lead to unexpected results. Set up students' ramps facing the walls (so the balls will not roll across the classroom every time.) 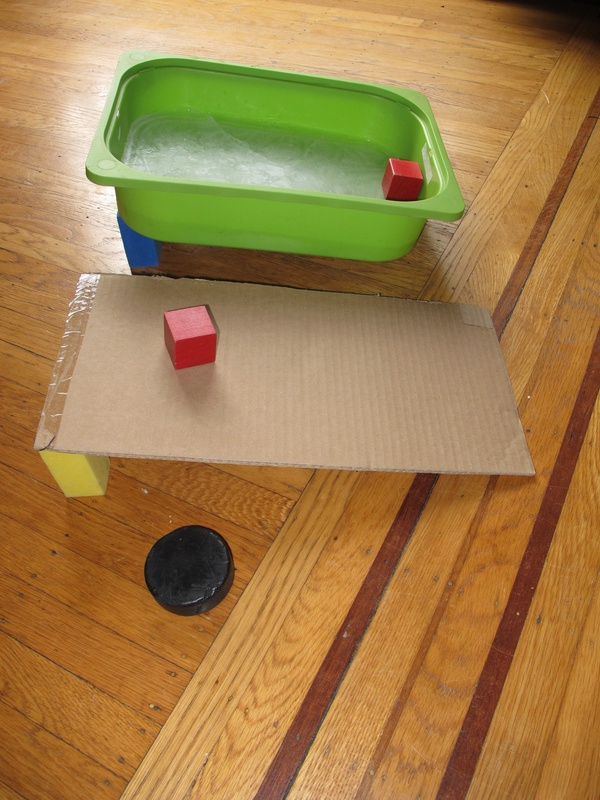 Students slide a block, a ball and an ice cube down their ramps (or use one long ramp, where the speed differences will be great enough, for a demonstration). Compare the speeds, and record results. It is important that there is no standing water on the ramp, so students should store their ice cube on a towel and dry it off before each use. The towel can also be used to keep the ramp dry. The ball and the ice went faster than the block (relative speeds of ball and ice will vary depending on the slope and what the board is made of). The block has the most friction - as the side of the block rubs against the board, the force of friction slows it down. The marble: when something is round it rolls, and does not rub against the other surface, so the friction is reduced. The ice cube: the thin water layer between the solid ice and the ramp makes them slip past each other easily. It reduces the friction. The water is called a lubricant. Why does an adult tell you to be careful if there are marbles or water or oil on the floor? If you tread on them there is so little friction (from the round shape, or the lubricant) that your leg can slip sideways and you fall. Summarize ways of reducing friction: lubrication (water, oil, melting ice) or rolling shape. Raise one end of the ice tray and the other test surfaces on blocks, so that they have the same angle of slope. Release the heavy objects from the same height on the slopes at the same time. Record the relative speeds. Do several trials for each. Alternatively, objects can be flicked across a flat ice surfaces, and other surfaces. Make sure to wipe up the standing water with a towel, or other forces complicate the results. The ice ramp should allow objects to move the fastest, as the very thin layer of water on the surface of the ice flows between the ramp and the object, making a very slippy interface between them and reducing friction. Smoother ramps should be faster than rough ramps, as the rough ramps catch the object as it moves (friction) and slows it down. In the sport of curling, the sweeping briefly melts the ice, which reduces the friction and allows the puck to move faster in these places. Skis are waxed to promote the optimal thickness of a water layer between the snow and the ski. A complication with this activity is that friction is not the only force involved - gravity is another force pulling the object down the slope - gravity and friction balance to determine the final speed of the object. As the slope of the ramp is kept constant and the weights of the objects are as similar as possible, the force of gravity is constant in each case, and so need not be discussed unless a student brings it up. Make sure to test the activity before using it in class. Friction is complicated and unexpected results are common. I took a while to find the right kind of ramp. It also needed rounder ice cubes to work best (the square ones got stuck in a puddle of water with the ramp I used). Try waxy blocks or surfaces to compare - test first! Try on a playground slide.